The U.S. Fire Administration estimates that about 164,500 residential cooking fires occur in the United States annually. In fact, cooking is the leading cause of fires and injuries that occur in the home. However, that doesn't mean you need to be afraid to cook. You can prevent kitchen fires by taking safety precautions. Your kitchen doesn't have to be a firetrap. You can take a number of steps to ensure that your meals don't go up in flames. According to the Washington State Fire Marshall, it's important to keep things that can go up in flames away from heat sources. Consumer Reports estimates kitchen appliances (including dishwashers) caused more than $547 million in fire damage between 2006 and 2008. Safeguard your home by maintaining kitchen appliances. Read the manufacturer's instructions and safety warnings for all appliances and follow them closely. Register all new appliances immediately so you can receive recall information. Act on product recalls immediately. Review product safety complaints for the appliances you have in your kitchen to assess potential hazards. Clean your range hood of grease buildup regularly. Inspect the power cords on all appliances regularly and replace them if they are frayed. Completely cool small appliances before storing them. Don't use extension cords. Plug appliances directly into outlets. Keep all appliances clean and free of crumbs, grease, and other food debris. Have appliances serviced regularly to keep them in good working condition. Don't wear loose-fitting clothing around cooking surfaces, especially loose sleeves. Roll up sleeves to keep them away from cooking surfaces. Tuck in shirts before cooking. Secure long hair to keep it away from cooking surfaces. Keep children and pets away from cooking surfaces. 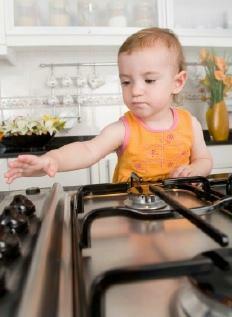 If you have children in the house, consider using the back burners of the stove. You can take a number of other safety precautions to prevent fires, as well. Prevent spillovers of grease or oil by not overfilling pots and pans. Keep metal out of the microwave. Be careful when lighting a pilot light or flame. Don't leave candles or sterno pots burning unattended. Install a smoke detector just outside of your kitchen. Don't put water on a grease fire. Instead, smother it with a pot lid or use baking soda or a chemical fire extinguisher. By taking the above precautions, you can prevent fires in your kitchen. A safer kitchen will help protect your home and family.